In Canada, it is known, both from research and the lived experiences of Indigenous students, that there are real challenges and barriers to them finding success in current school systems and structures. Typically, the voices of youth are not heard. Enhancing Indigenous Education Through Co-Creation was designed to ensure that all voices would be heard in addressing these challenges. In order to achieve this, The Rideau Hall Foundation convened two national gatherings in May and June 2106, one focused on youth, under 20 years of age and representative of the diversity of Indigenous young people and a second for national Indigenous and non-Indigenous leaders and organizations; those with a focus on education and youth issues. We partnered with local First Nations who hosted these important gatherings. Our team of Indigenous staff, in consultation with the Rideau Hall Foundation, local host Nations and national leaders, recruited and engaged the participants, designed and delivered a process (and program) for each gathering, reporting back to the convener and participants. Though the gatherings are now complete, the story of this project has been barely authored. 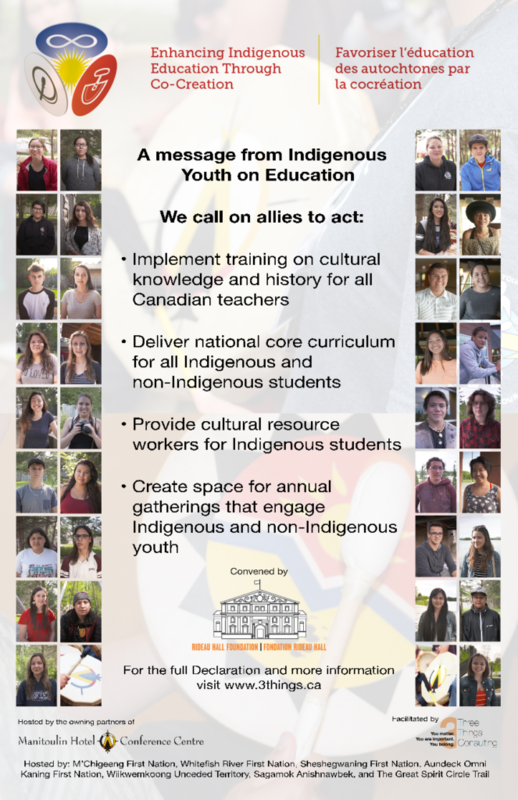 We expect to see continued positive effects for Indigenous students and non-Indigenous learners across the country. Here are some snapshots of the existing outcomes to date. To learn about the outcomes from the Co-Creators Gathering, click here. Hosted by the Owning Partners of the Manitoulin Hotel & Conference Centre: M’Chigeeng First Nation, Whitefish River First Nation, Sheshegwaning First Nation, Aundeck Omni Kaning First Nation, Wiikwemkoong Unceded Territory, Sagamok Anishnawbek, and The Great Spirit Circle Trail, this first gathering engaged 36 youth representing First Nation, Inuit, and Metis youth, under 20 years of age from every province and territory. The Youth Wisdom Carriers used a model of discovery and sharing to learn about and talk about issues critical to their education. Incorporating cultural and land based activities and honouring activities celebrating the courage and gifts of the Youth Wisdom Carriers, through their diverse lived and education experiences they explored identified best and promising practices and research on education. Using a traditional consensus model, these youth leaders authored a Declaration and a set of recommendations that they believe will help improve education outcomes for all Indigenous students. 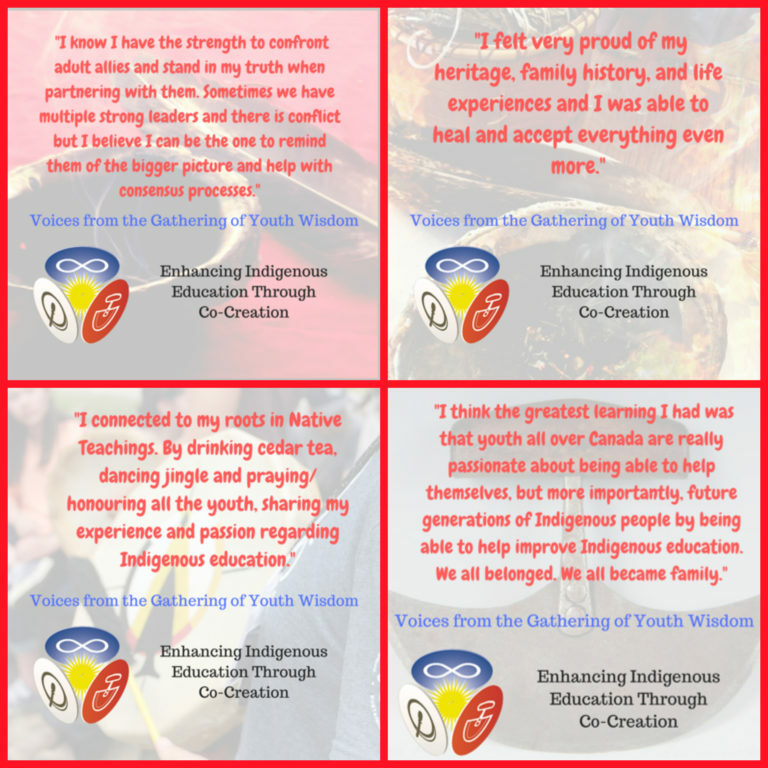 Young people who attended the Gathering of Youth Wisdom shared some of their experiences through daily evaluations and a more thorough follow up evaluation. Meet the Carriers of Youth Wisdom.